The average number of pigs weaned per sow per year reached 25.9 in the 12 months ending March 2018, an increase of 0.8 pigs compared to the 12-month period ending March 2017. The data also suggests the overall breeding herd performance was particularly strong in Q1 2018. The increase in sow productivity was driven entirely by the indoor herd. The average number of pigs weaned per indoor sow per year reached 27.4 in the latest 12-month period, an increase of 0.4 compared to the 2017 average. This increase was supported by both a rise in the number of pigs born alive per litter and a slight decrease in indoor pre-weaning mortality rates. Meanwhile, the outdoor herd recorded a slight decline in the number of pigs weaned per sow per year in the latest period, compared to the 2017 average, standing at 23.9 pigs. The number of pigs born alive per litter rose marginally, however, this was counteracted by a higher pre-weaning mortality rate. 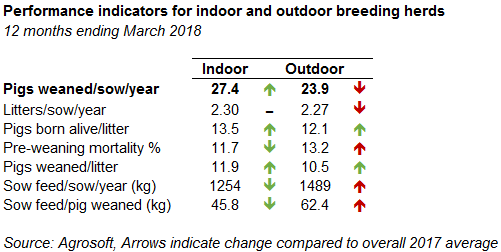 Interestingly, indoor breeding herds also recorded improvements in terms of inputs in the 12 months to March 2018. 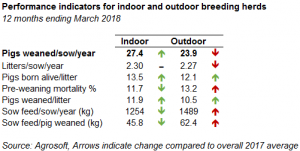 The annual average feed consumption of each indoor sow decreased by 45kg compared to the 2017 average. Conversely, annual feed consumption for each outdoor sow increased by 26kg over the same period. This meant that the difference between indoor and outdoor sow feed consumption widened to 235kg, compared to 164kg last year. Felicity Rusk, trainee analyst at the ADHB, said: “Performance traits for the rearing and finishing herd were also generally positive for the most recent 12-month period. The feed conversion ratio (FCR) for rearing pigs decreased slightly from the 2017 average, to 1.75. This is, however, still 0.04 points above the 12-month average for this time last year. Meanwhile, the FCR for finishing pigs decreased significantly from the 2017 average, declining 0.16 points to 2.70. A lower FCR means less feed is required per kilogram of weight gained. Despite on average arriving at the finishing unit a day earlier, feed consumption for finishing pigs has also declined relative to the 2017 average. This reflects the more efficient feed conversion ratios being recorded, as daily liveweight gain was higher. Compared to last year, the average live weight at slaughter has also been higher, averaging 109.7kg. With feed costs rising, the improved feed conversion ratios have been key to minimising production cost increases in recent months.